NOTE:1 You will be moving from this page to your own computer as you work. To go back and forth between two documents on your PC, use your keyboard. Hold down the key "ALT" and click the key "TAB." That will take you back and forth between two documents. NOTE2 : Some of the pictures may be a little different than what you see. Ask for help if you need it! NOTE 3 : IF YOU HAVE TROUBLE READING THIS SCREEN, ASK FOR OR GET A COLORED SCREEN COVER FOR YOUR MACHINE. create a life table in MS Word. modify text and color in the table. To find out what is expected of you in this task, read the Rubric and the Checklist before you begin. Then return to this page. CLICK THE ARROW TO GO TO THE RUBRICS AND CHECKLIST. STEP 1 - READ THE PASSAGE BELOW. A table is a set of columns (vertical spaces) and rows (horizontal spaces). The table on the left has two columns and three rows. Each enclosed space you see is called a cell. The table at the left has six cells (2 X 3 - 6). Tables are used for many purposes. One is to present the relationship between items or information. The table on the left shows John's and Karen's hobbies and career choices. To make information easier to read in a table, you can use different fonts (text) and cell colors. If you haven't completed the Word Title Task, click on the arrow and follow those instructions. They will teach you some basics about Word before you create tables. When you complete the Word Title Task, come back here and follow the instructions below. Now to create your own table. Open Word. The click on TABLE -> INSERT ->TABLE on the toolbar. 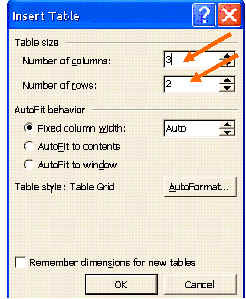 In the window (box) that appears, use the arrows or write in the numbers 3 (for columns) and 2 (for rows.) and click OK.
A table will appear with three columns and two rows, for a total of six cells (3 X 2 = 6). When you rest you cursor (mouse) gently over any column or row, an thick little black arrow appears. If you click on that arrow, it will select the column or row you are on. If you click, hold the left mouse button and drag, you can select (shade) as many cells as you want. Once you select and area, you can then modify it. You can change its color, add border, modify the text in it and its placement, and more. If you decide that you want the table lower or toward the center, click on the four-way arrows at the top left. Drag the arrows and the table will move. Let's enter some text in a cell. Click on the top middle cell and "Monday." Click on the other cells and write the words you see on the left. Now we will manually change the width of the columns. Rest the cursor on the line you want to move. When a two-pointed arrow appears, drag the line in toward the left to make narrow the column. Select the two right columns as you learned to do above (rest the black arrow and drag). Then RIGHT-click within either column and select "Distribute Columns evenly. That will make them the same width. Now let's change the color of a cell. RIGHT- click in the "Things to do" cell. Select Table Properties. 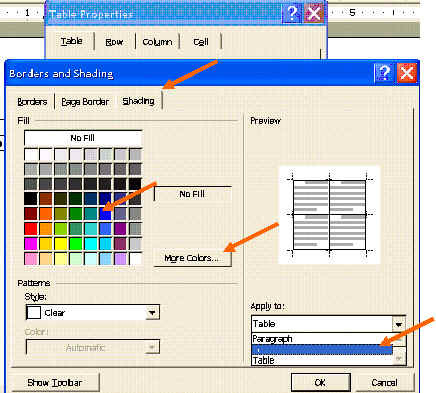 When the window appears with all of the options for the table, click on borders and shading. Then click the Shading tab. From that window, select CELL under the "Apply To" selections. Go to the "Fill" options and click on the blue you see selected on the right. As you create your own table, notice the "More Colors" selection. That will give you a much greater choice of colors for your cells. If you chose to "Apply to" the table, the whole table would change to the color you selected. Now let's change the text color so that you can read the words more easily against the blue blackground. Drag your cursor across the text "Things to do." 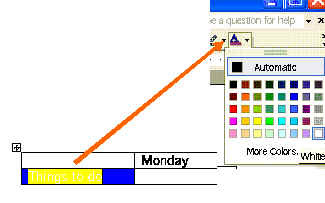 Click on the icon for thext color, as shown at the right. Click on the "white" box to change the text to white. Practice entering words into the other cells, changing the cell and text colors, adjusting the size of the cells and applying what you've learned. 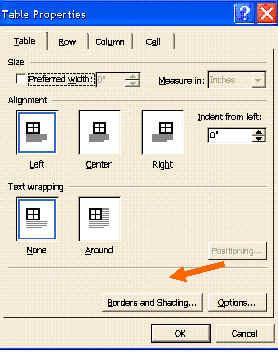 Before completing the task for this segment, notice that you have other options when you click on TABLE in the toolbar. STEP 2 - GO TO THE LIFE TABLE EXERCISE. If you want more practice with tables, reproduce the comparison table you'll find by clicking on the link below. STEP 4 - EVALUATE YOUR WORK.